Properties in Luggate average 4.6 out of 5 stars. 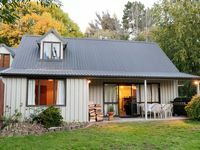 Relaxing Kiwi Crib suitable for families. 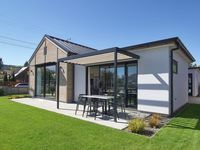 Property 14: Relaxing Kiwi Crib suitable for families. Property 15: Modern, Spacious Flat, seperate from the Main House. Property 35: Awesome house, great location! Beautiful setting, beautiful accommodation, wonderfully equipped home and friendly helpful hosts. Only regret is we only booked one night. The property was very quaint and very comfortable. There was a BBQ area with a nice porch and table to laze the afternoon away when our toddler was resting. The facilities were nice with a tall high pressure shower. Cozy bed on a mezzine level. Very up to date with all mod cons. The location was 10 minutes drive from lake Hawea that had a beach. Albert Town had local amenities too old fashioned chip shop wrapped in newspaper - have a beer while you wait or dine in. 10 minute drive to wanaka township. Very friendly hosts, but let you get on with it. I would love to come back you could easily spend a week here.